How did the guild get its start? The guild actually started all the way back in StarCraft, as a small but really great guild. Since then Nano has existed in various other games (e.g. World of Warcraft and City of Heroes), but always as a small and social guild. In SWTOR, me and a friend from real life started playing on the server Ula VII at launch, and at first the guild was mostly used as an advanced form of friendslist with people we grouped with. We were really really lucky to get a fantastic group of core members at the beginning, and the friendly and helpful atmosphere really set the tone for when the guild grew larger. Now unlike some other guilds, Nano has actually two beginnings in SWTOR. What lead to the guild reforming and what all changes did the guild undertake? The guild started out as an Empire guild, on Ula VII, and we all had a great time leveling to 50, and when we reached 50 we started doing Hardmode flashpoints and eventually started raiding. The problem was that around us, people were leaving the server. Ula VII was a low population server even from the start, but as people were fleeing to more populated servers, it really became more of an empty shell, with a maximum of 30 people on fleet at peak times, and on odd times 4-6 players on fleet. This was kind of depressing and I noticed people from our guild not really logging in as much, people were talking about creating republic alts on another server, etc. – So the other guildmaster and I took a decision, and created a republic sister guild on a heavy population server as an alternative. At first it was not meant to replace the old guild, but when the floodgates opened, and people tried it, almost all of the members went over there almost from day to day. The only problem was that since this decision wasn’t really coordinated that well, a few of the members on the old server felt abandoned. Over the next few days, I logged in on the older server and persuaded almost all of the last remaining players, to at least give the new server a chance, and when they saw how fantastic it felt to play on a well populated server, where you can actually get groups going in under a minute, they never went back. But we did lose a few players to the transfer, but I estimate that we lost fewer players than if we had decided to stay, since a lot of members were contemplating quitting the game. How hard was it to convince guild members, with level 50 characters, to switch servers and also switch factions? It was actually easier than you would think. But I really think it depends a lot on the guild. I think in this case a lot of the members didn’t move simply because of the higher population, but rather went following because we were already then a tightly knit group, and I think a lot of our members have reached a point where they actually think of Nano as a part of SWTOR. How has the change worked out for Nano? Has the guild embraced the new faction and storylines? I think the change was even more of a blessing in disguise than we think. While we lost a few members to the transfer, we have gained a lot of really nice members on the new server, Tomb of Freedon Nadd. And the process of being kind of forced to the whole process of leveling up again, gave the members a chance to play with all the new members, and even re-play the game with each other. Also, and this is probably the most important thing. If I have to be brutally honest, then right now there really is a lack of endgame contents in the game, and I could have feared that a lot of our members would not have had the patience for 1.2 to be released, before unsubscribing (at least temporary), and I think that the server transfer, which has forced people to level up again, has really postponed people realizing this. Most of the members are between 35-45 now, and I think that the release of 1.2 will be perfectly timed, so that no one will start thinking about the lack of contents, because we can easily fill up 1-2 months of gearing people up through the current Hardmode flashpoints and raids, and the people in our guild playing PVP will have their hands full getting to Battlemaster rank again. But, don’t get me wrong, I’m not one of those persons screaming “this game will die in 24 hours!!11!!one!”. I think this game has an absolutely huge potential, and I really look forward to the game evolving over the years. Also, while I think that the game maybe could have used a bit more polish before release, I can appreciate that some bugs just won’t be found until the game is available to everyone. And while I would also have liked more endgame contents, I think it’s absolutely amazing how fast Bioware is releasing new stuff (and fixing bugs for that matter). From your forums, I have read about some of your planned events. Can you tell us what events the guild has done & what future events is Nano planning? We’ve had two “World Boss Slaying” events, one on the old server, and one on the new server. Both were great successes. 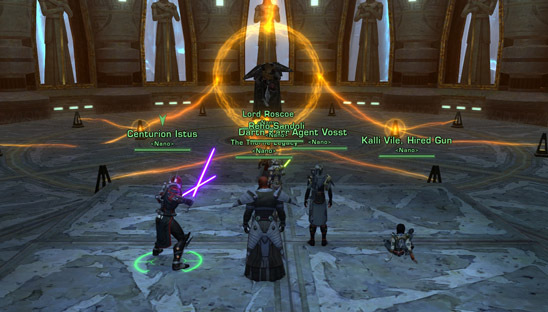 We’ve also had some Datacron events, and especially had fun with the +10 stats Datacron (which we eventually had to give up on, because the MGGS system was so buggy, and it was impossible to coordinate it so that the 20+ people got to the Datacron without dying. We since held a smaller version of that event where we were only 6 people, and everyone ended up getting the Datacron (eventually we figured out how to avoid the MGGS bugs), so that will probably be revisited on the new server when people get to 50. This past Sunday we arranged a guild Tatooine Speeder Race, for fun and even some credits for the top three finishers! We’ll be arranging a new event every week from now on. I’d really like to conquer some large imperial outpost by killing the level 50 champion guards and just taking it over, as a guild event. It would also be fun to arrange with a huge imperial guild to meet up somewhere and do an all out war. The guild has created its own newsletter, which I think looks amazing. When did this get started? What would someone need to do to sign up to receive a newsletter and how frequently do the issues come out? Thank you! We’ve had great success with our newsletter, The Nano Gazette, and I know quite a lot of our members look forward to receiving it. The newsletter is really an attempt to create a bit of fun for the members, while they’re not playing, and of course to remind the members about future events, and to highlight the last event. We’ve actually only had 2 editions of our newsletter so far, since it started 2 weeks ago, but it’s a weekly newsletter and is sent out every Tuesday. Before this Q&A it was a member’s only newsletter, but since it’s already visible on the website, I have now made it possible for people outside the guild to sign up. 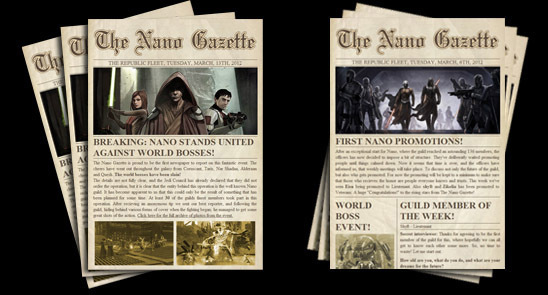 (Link: http://www.nanoguild.com/newsletter_archive/) – You can also see the previous issues on that page, before signing up, to see what you’ll be getting. The top artwork on the issue to the left is from the amazing artist Benjamin Carré, and the one to the right is a modification to an official Bioware wallpaper. What class and advance class are you currently playing? Since switching factions how have you personally found the class stories? My main on the old server was a Sith Assassin tank, and I had so much fun with it, so I actually rolled a Jedi Shadow tank on the new server, and I’ve had a lot of fun with it so far. I’m currently level 45, so I hope to hit 50 next week and start gearing up. I thought the class server on the Inquisitor was good. I was really worried about the Jedi Consular class story, because it looked a bit boring in the start, but it’s really picked up, and I enjoy it very much now. If I have to say one thing that annoys me, it’s the whole Project vs. Shock ability issue, where animations are different, and thus it ends up with shock being better (because it does the damage instantly, as compared to Project which does the damage when the animation has finished), but since I read on the forums that they’ll be fixing it, I can live with that until they do. 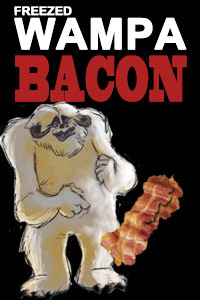 In your forums, the guild talks about other things besides SWTOR. Do you think this keeps the guild closer and a family feel? What are some of the popular non-game topics? Yeah, I really think so. This is also pretty reflective of the guild chat, where people talk about all sorts of things. People really enjoy discussing other games (especially old ones), books and series. And while I enjoy talking about the game, I really think that it’s the different opinions on a wide range of things, that makes you know the person behind the character, and will end up forming friendships. What are some things you and the guild are anticipating in Patch 1.2? What are some things you all would love to see in the new patch that were not discussed at the Guild Summit? Well, as every guild can probably agree, the guild bank will be really nice. A lot of our PVP players are looking forward to the ranked PVP, and the PVE players are excited about the new raid, flashpoint and the legacy options. Personally I hope to see more “timesinks” in the game, so you have something to do when not doing operations, PVP or flashpoints. I think the whole world lends itself quite nicely for some kind of reputation system between various factions. I’d also like to see space missions become useful after level 50, and not just as a level mechanism. I don’t think this will happen in 1.2, but it makes me happy that the developers have expressed that they’re working on it. Is Nano currently recruiting? Are there specific classes/advance classes or roles the guild needs? What steps does a potential recruit need to take to apply? We don’t do much spam-recruiting (posting to general chat), but we encourage our members to mention the guild, in a non-annoying way, if they play together with nice people who’re not in a guild. We don’t look at roles when recruiting at all. We recruit the person, not the character. Also, we try to be very non-elitist. Right now, we’re not raiding because we’re all leveling up again. But we won’t have a primary and secondary raid-group like I’ve seen in other guilds. Instead we’ll encourage people to form raid-teams of 5 members on our website. The raid groups will then consist of those 5 core-members, and every week the teams has to bring 3 players with them who are not part of the core-group. This is both to encourage playing with members you’d normally play with, but also to help gear fresh players up. As for getting invited to the guild, all you have to do is ask a member of our guild for an invite, and they’ll then ask one of the ranking officers to invite you. The only thing we require is that you sign up on the website as soon as possible after that. Since we use the website for so much (newsletter, forum, raid-groups and events) it’s not an option to be a member if you don’t want to sign up. What is the best way for people to follow the guild and/or contact the guild for more information? The best way is probably just to sign up for the newsletter, look through the forum (A “Guest” category is coming soon[tm]!) and the website every now and then. That is it for this week’s Guild Checkpoint. I want to send out huge thanks to the entire Nano guild family. You all have a great vibe and amazing teamwork to stick together, even when switching servers! I also want to thank the Nano guildmaster – Avo. He was a great help in getting the information and images for the article. Avo also deserves a pat on the back for leading the guild through all the changes and keeping everyone together! All the best to Nano and the members, in-game and in everything you do. Are you in a guild or a leader in a guild? If so please contact me and see if we can tell the community about your guild. Just submit your guild’s website and some basic information in an email to me at, jason@corellianrun.com. Look forward to highlighting more guilds here at Corellian Run Radio. Thanks and see you next week!